TV Bulletin Board (Thurs., Aug. 25) -- J Lo returning to Idol, etc., etc. Jennifer Lopez and husband Marc Anthony parted ways in American Idol's post-season, but she'll be renewing her contractual vows as a judge on the Fox juggernaut. Lopez, whose return had been in doubt, has signed on for Season 11, which will launch on Jan. 22nd. 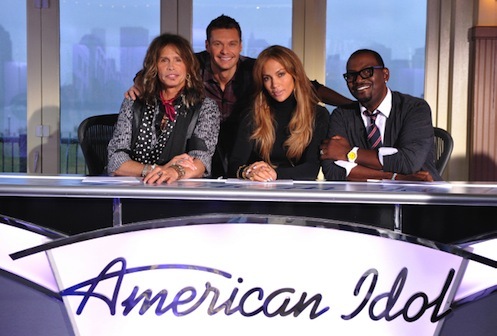 Fellow judges Steven Tyler and Randy Jackson were already committed to return, as was host Ryan Seacrest. "From the very first day of auditions, we knew we had something special in our new judges panel, and we're so happy that America felt that way, too," Alternative Entertainment President Mike Darnell said in a publicity release. Idol had a resurgent Season 10, the first in which alpha dog Simon Cowell was not a judge. Ratings were up, reviews were largely positive and Idol has 10 Emmy nominations heading into the Sept. 18th prime time ceremony on Fox. Jimmy Iovine, Idol's in-house "mentor" throughout Season 10, is not mentioned in the Fox announcement. So his return may still be iffy. The show's next audition stop is Friday, Aug. 26th in Houston. ***More and more it seems to be coming to this. Tony Bennett's promotional campaign for his new Duets II CD will include a live concert Sept. 10th on the Home Shopping Network, now known as HSN. Bennett, 85, has 17 tracks on the disc, crooning with the likes of Carrie Underwood, Aretha Franklin, Lady Gaga, Josh Groban, Sheryl Crow, Willie Nelson, Norah Jones, John Mayer and the late Amy Winehouse. HSN says it will offer a "special exclusive 2-disc bundle," for $14.95, and Koss Stereophones for $149.99. The one-hour concert/sell-a-thon starts at 6 p.m. (central). ***TNT has started production on Perception, a new crime series starring Eric McCormack of Will & Grace fame. He plays an "eccentric neuroscientist" who specializes in apprehending crooks. Rachael Leigh Cook co-stars and LeVar Burton will have a recurring role as a university dean. McCormack previously co-starred with Tom Cavanagh in the 2009 TNT series Trust Me, in which they played Chicago-based ad men. But it lasted just a single season. ***CBS' Survivor: South Pacific, which premieres on Sept. 14th, will have Dallas mortician Stacey Powell, 44, among its new batch of castaways. Brandon Hantz, a 19-year-old oil tanker crewman from Katy, TX, will join her on the show's Upolo tribe, headed by former Survivor competitor Benjamin "Coach" Wade.